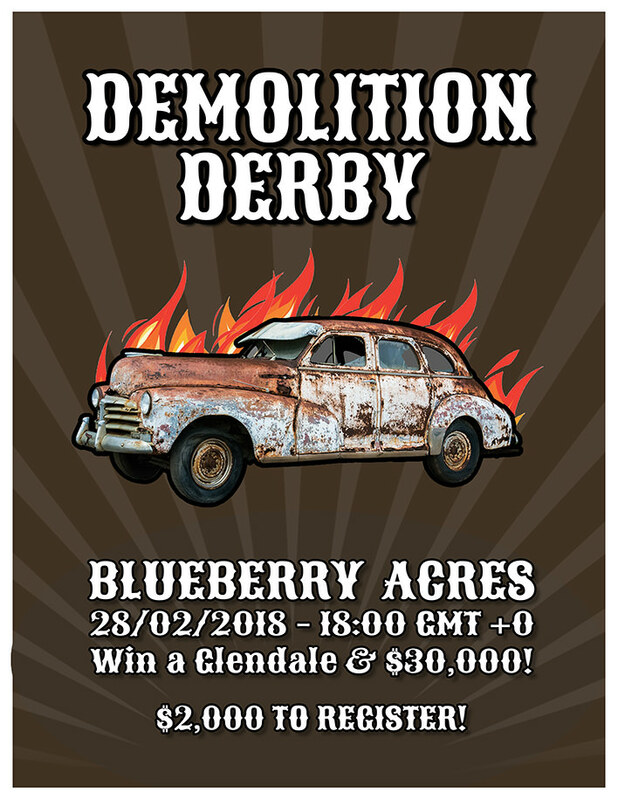 Demolition Derby - Blueberry Acres on Feb 28th! Wait, what? 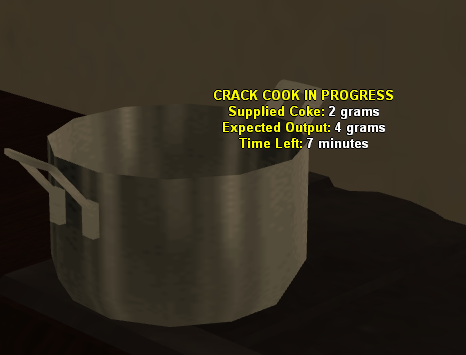 You mean... 2.6, right? I AM SO CONFUSED! WHERE IS MY 2.6?!? Go to this thread for more information. 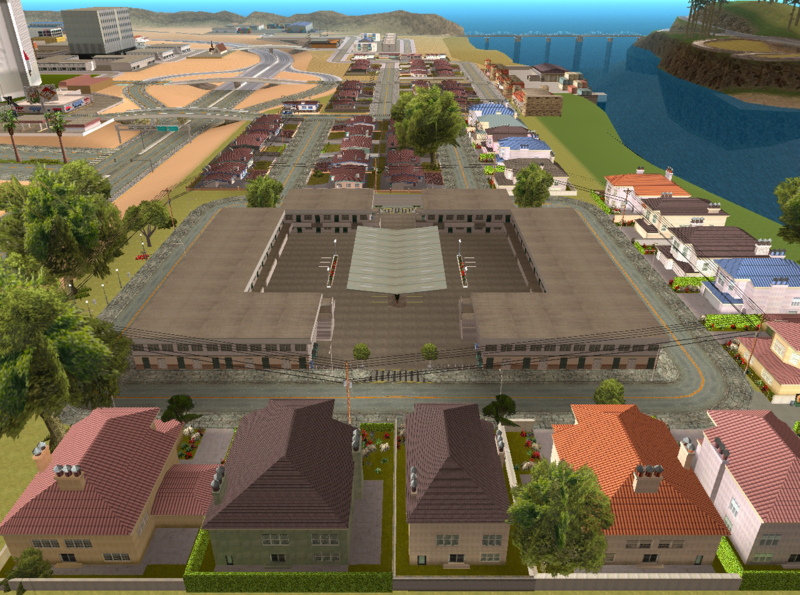 RC-RP Version 3.0 comes with San Andreas Multiplayer's latest branch release — SA-MP 0.3.DL. You will need to update your SA-MP client with said version in order to connect to the server. 0.3.DL features a major game-changing update to San Andreas Multiplayer, with serverside model importing being the main highlight of this update. It carries all the features implemented during the development of the now-defunct SA-MP 0.3.8 (RC1 to RC4-4). Refer to this link for the changelog. You can download SA-MP 0.3.DL-R1 client here.? In a merger reportedly worth $1,000,000, SAN Network has today merged with the local radio station, m9Radio. "Founded by Sean Murphy in late 2014 m9Radio was set-up as a company to provide equipment for DJ Montell, however, it exploded when Daniel Evans took on the role of special guest DJ in January leading a crowd of around 35 people to dance on the streets of Montgomery." Returning a radio aspect to SAN Network is just part of the networks' plans to modernize their services. Combined with their hunt to purchase nightclub premises, SANN plan to cover all aspects of the entertainment industry. In talks with m9Radio, plans were mentioned for the provision of personal radio streams; regular club openings and other constant expansion. I don't make formal statements, and this isn't going to be any different. We've said 'f*** it' and merged with SAN. Why? Easy. More power. SAN Network has always been that straight shooter of a company that was afraid to have fun. Thanks to a new company director it is about to change. m9Radio is going to bring some fun back to the county and SAN is going to help us. We hope you enjoy the talk shows, banter, and usual shenanigans that will happen over the next 9000 years. Both organizations hope this to be mutually beneficial and look forward to working together for a better network! It is that time of the season again. For the first time in the year 2018, the graduation ceremony for Academy Batch #03 was held in the Ceremony Hall of Dillimore Sheriff’s Office. 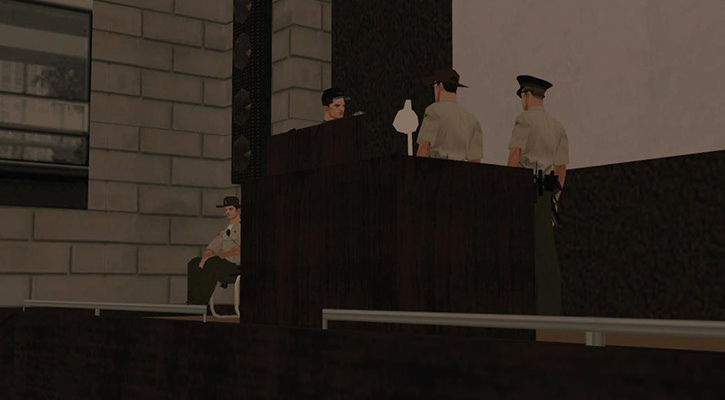 These Deputy Sheriff Generalists, who endured some of the most intense and lengthy forms of training, succeeded in their formal welcoming as full-time deputy sheriff’s within the San Andreas County Sheriff’s Office. From 5 January to 16 January, the Recruitment and Training Unit received a total of 51 applications. Whilst a select few of these applications fell under the were duplicates, a total of 41 separate applicants had applied. Out of the said number, 23 applicants had actually succeeded in making it to the academic stage. 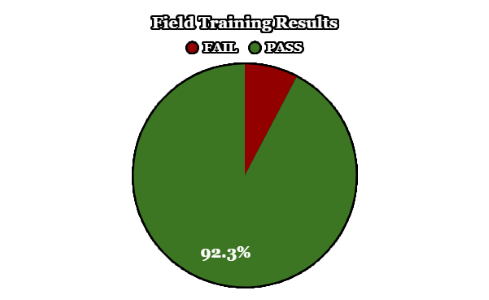 Only 16 of these academy students were able to take and pass their exams, where they were forwarded to the Field Training Stage on January 25. Only 12 of these academy students were able to meet expectations and endure the high set standards, with those who sat the Field Training Exam achieving majority success, with a positive pass rate of 92.3%. 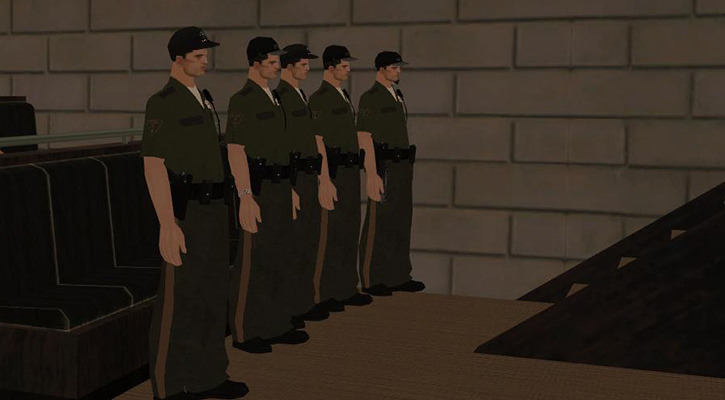 Before proceeding to the ins and outs of the graduation ceremony, although a significant amount of Generalists were unable to attend the ceremony, we would like to congratulate the following deputies in their push to progress through serving their community and State, as they are now serving within our ranks! 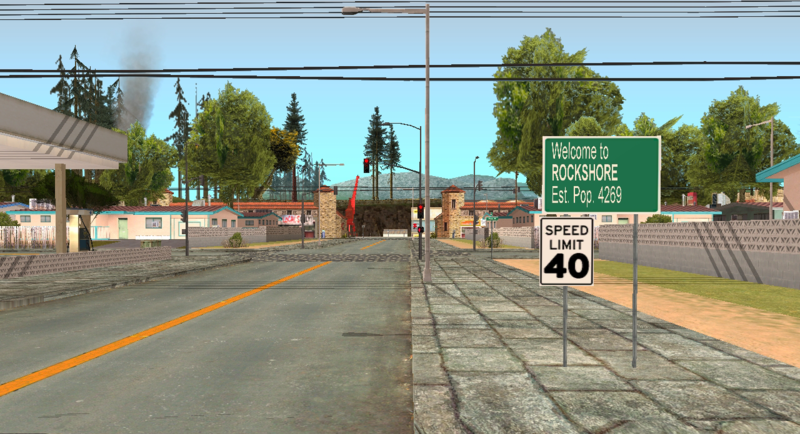 The ceremony took off at 4:00 this afternoon, with spectators settling themselves into the seats at the San Andreas County Sheriff's Office's ceremony hall. The Generalists were marched in under the command of Lead Detective Claude Fowler over to the front of the ceremony hall, where they were placed in order before handing over the spotlight to Captain Christopher Kenway. The Captain took us through the entire academic process, creating somewhat of a story as to how the Generalists ended up where they are now, and highlighting the obstacles they faced they were able to overcome. Following on from this, the microphone was passed over to Sheriff Deacon Bohannon, who expressed nothing besides pure delight and gratification in his speech. In his speech, he thanked all those who attended the ceremony, seeming very pleased by the fact that the graduation ceremony was not delayed due to uncontrollable emergencies, which consequently delayed the previous graduation of Academy Batch #2 by one hour and thirty minutes. Bohannon proceeded to reflect upon the future of the department, and particularly the role that the graduating Generalists play in preserving the integrity and showing dedication in the department. And most importantly, letting them know that now is the start of a long and opportunity-filled experience. I, do solemnly swear that I will support and defend the Constitution of the United States; and the Constitution of the State of San Andreas, against all enemies, foreign and domestic; that I will bear true faith and allegiance to the Constitution of the United States and the Consitution of the State of San Andreas; that I take this obligation freely. Without any mental reservation or purpose of evasion; and that I will well and faithfully discharge the duties upon which I am about to enter, as a Deputy of the San Andreas County Sheriff's Office, so help me God. After the reciting of the oath, the crowd applauded the recent graduates in their success, wishing them good luck in their journey ahead of them. 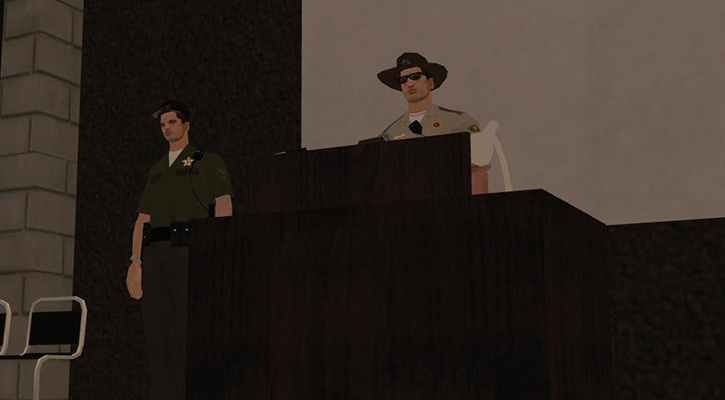 After exiting the ceremony hall, Deputy Richard Hill was able to obtain a few statements from our recent graduates Sebastian King, John McDowall, and Jason Auclair, to get their opinion on how they found their time and what they look forward to in serving the San Andreas County Sheriff's Office. 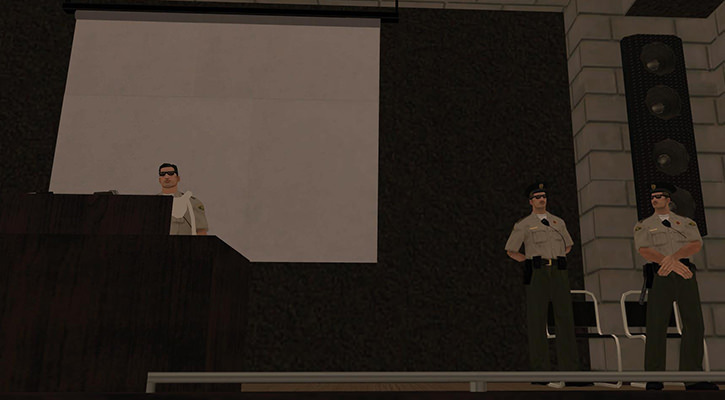 As always, we wish to thank everyone for attending the Graduation Ceremony and for showing their support to not only the San Andreas County Sheriff's Office, but also the recent graduates themselves. We look forward to seeing them in the field and hope that in the next batch, we will see nothing besides the high levels of commitment seen in that of Academy Batch #03. 'Nice Buns', a snug breakfast shop tucked away in a quiet area of Montgomery. The atmosphere of this restaurant is absolutely amazing. Quiet, homely, and safe. Five stars for this aspect. The service I received was very good and did not take too long. However, the shop was quite busy and there was only one person working the counter. He had to work the register as well as make the orders. Hire some more help! The home-brewed coffee and homemade donuts were simply divine. The quality of the products makes this little restaurant a perfect place to stop for a hot cup of coffee on a cold morning before heading off to work. The building, unfortunately, looks too chain restaurant-like. I think that a uniquely-designed interior would attract more customers, as well as attract more potential employees who would enjoy working in a unique atmosphere. Despite how obviously understaffed the restaurant was when I came in, the one person behind the counter was very organized. The restaurant is very clean and everything seems to be in just the right place. Montgomery. Not very much to be said about this town. Despite being in such a controversial town, it's tucked away in a quiet corner of the town not very frequented. Because of this, it seems to be a safe, desirable locale. I really didn't see much in the way of detail. There's no artwork, no photography, no fitting music. This can be improved. 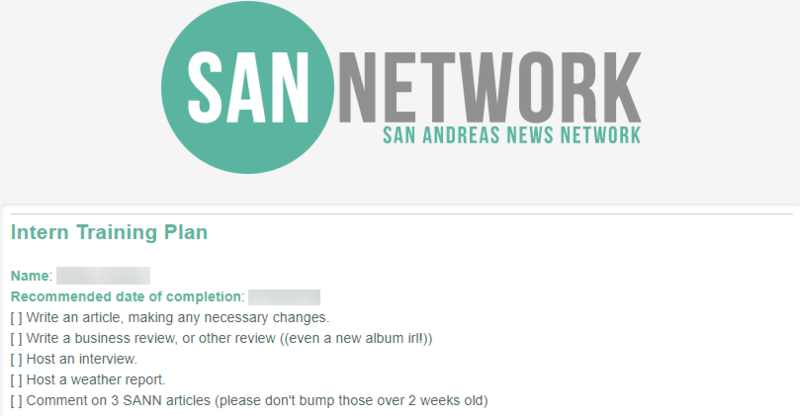 San Andreas News Network has undergone a considerable amount of changes lately, one of the many being the Internship program - which is currently hiring! It has now become easier to get your foot onto a new career path, in fact, you can become a fully fledged Junior Reporter in just 5* (*excluding the application) steps. SANN's new leadership have introduced an improved training scheme meaning that with the support of supervisory staff you could be stepping into your new job in less than a month! SAN Feed is a new and modern take on the entertainment industry. Taking inspiration from the articles you often see on social media, SAN Feed aims to provide a quick and easy reading that'll make you smile and often feel a little nostalgic. With articles such as "10 Things You'll Remember If...", this new idea adds a personal touch not only for the writer but for the reader too. With SAN Network's new CEO coming from an events background, it's only logical that events would become a forefront in the upcoming months. Easter is fast approaching and with other ideas on the horizon, you can expect big things heading to San Andreas. Why not give something new a try? Apply today! San Andreas' longest-serving news agency has received a complete overhaul in the past few days, including the introduction of a new management team. In a decision made by the network's board of directors, previous CEO Tyrell Price was amicably removed in order to push the organization into a new and improved direction. The boards' replacement of choice, Pippa Ashworth, has already stepped in with new branding; resources and a wave of plans in just two days. 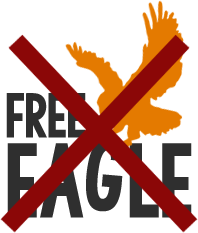 Joined by ex-Free Eagle Co-Owner Lulu Woodard, the pair have also succeeded in a merger with the San Andreas Writers' Society, hiring their Vice President as Network Manager. Miss Ashworth released the following statement. SAN Network is definitely going to be a challenge, but one I'm excited to be a part of. As I've recently moved to San Andreas, I thoroughly look forward to meeting new people as part of this transition, especially further getting to know the current employees of SANN. Personally coming from an events background, I will be implementing more initiatives and events for the local community as well as working closely with the team to continue producing quality content. With the networks profits up by just short of $4,000,000 since their succession, it'd appear to be all systems go for the new executive team. The network aims to keep you informed of their new plans and sincerely hope you notice a visible improvement. SAN Network staff would also like to thank you for your continued support. Do you wish to embark on a new career path? SAN Network is now hiring! Click here for more information. SAN Network CEO Tyrell Price has found himself in deep water today following the conclusion of a long-standing court case, began by himself, against charges placed on him by the San Andreas County Sheriff's Office. Represented by equally controversial lawyer Sarah McOnelly and John Thever, a colleague and ex-colleague of Price's respectively, the case was launched against the charges "§221.000: Obstruction of Justice - Non-Traffic Misdemeanor"; "§208.000: Failure to Comply - Non-Traffic Misdemeanor"; and "§114.000: Reckless Driving - Traffic Law" placed on Price on 22nd November 2017. The charges came to fruition when Mr. Price joined a SACSO pursuit, deeming it "news-worthy". It was claimed that "he, therefore, started to follow the pursuit in a safe and responsible manner, constantly remaining behind the pursuit line and allowing for any Deputy to pass him and to get in front of him" - a claim proved incorrect by strong supporting evidence from a recently deceased Deputy. A video was presented to the court by Mr. Deacon Bohannon, representing his own department, showing the ex-San Andreas State Police Lieutenant tailing the pursuit, even getting into the pursuit line himself. Requests made by Deputies for Mr. Price to pull over were ignored and a sub-pursuit ensued. All charges were ruled by Chief Justice King as valid and thus upheld. With a network run by the girlfriend of a drug dealer and a convicted ex-law enforcement officer, is the San Andreas News Network really a source worth trusting? Merry Christmas from SAN Network! Christmas is around the corner, and New Year's Eve just right on the doorstep coming. The time of year has come where we forget all our sadness, demises, worries and celebrate in joy, rightness, enjoyment and fun. From home to home, and heart to heart, from one place to another, the warmth and joy of Christmas, brings us closer to each other. And the celebrations and enjoyment we do have at this week, is not something to miss of! This new year comes with lots of happiness and love with unfolded hands. Have had worries with your past year? This is the new start-off for your life, a road which will have it's ups and downs, but how you confront and change yourselves according to, is needed. We all had our worries and step-down moments, some bright, some dark;some cherishing, some demising but it's the inner self that made us stand till far, and we've seen the year end like an envelope, coming in with open letter and departing with a closed one. One has rightly said, time flies off by and things change-by, we change ourselves, our basis of understanding but let's think of the day today and not the past. Let's keep the inside of ourselves same and do the little fun of making us enjoyed and better as one chapter of our life ends. It's new year coming. Christmas is not a time or a state of mind but the real spirit of Christmas lies in cherishing peace and bringing good will. To be plenteous in mercy, is the real spirit of Christmas. Just thinking of this things, will be born a savior and real-person in us, which will shine a star and send it's ever-lasting gleam of hope to all. We all can do a bit of ourselves, let's bring out something from us on this Christmas. No matter whatever is happening around the world, let's celebrate happiness and love. Let’s take a toast of new year’s happily wishes which are still awaiting to come true. We, at SAN Network, hope that the spirit of Christmas brings you peace, gladness of Christmas gives you hope and the warmth of Christmas grants you love. Wish you and your family a very happy new year which is full of love. Let’s take a toast of love and togetherness. 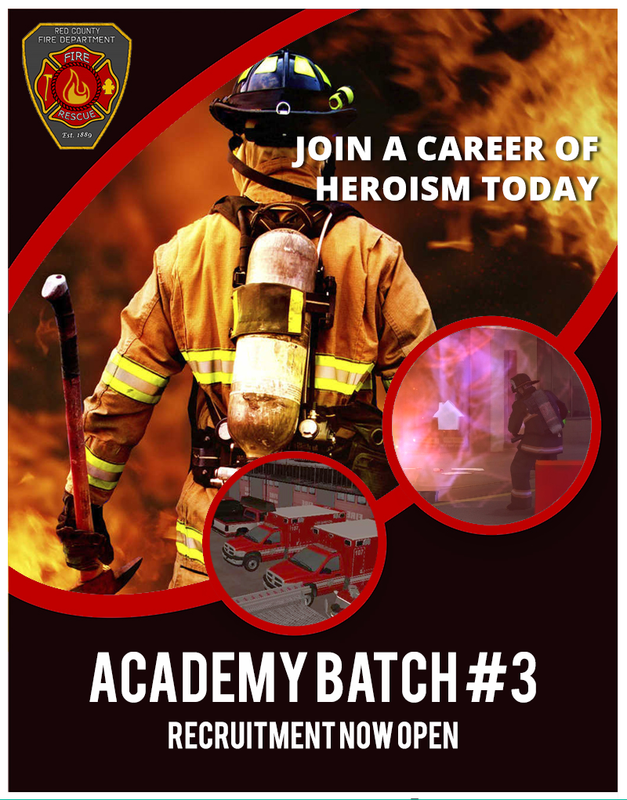 RCFD - Join a Career of Heroism Today!